Nestled among historic oaks and stately Charleston residences, 60 Bull Cafe enlivens Harleston Village with bright interesting offerings, approachable relaxed seating plus takeaway wine and beer selections. Stroll into the cafe on your way to the office for a bite or linger over a glass of wine in front of our picture windows for the evening. We invite you to come back soon and often. A lively conversation can begin just about anywhere and we think that a good meal provides the perfect place to start one. We aim for friendly polite service, hot food made fresh daily, a place where great standbys and new local favorites are in regular rotation on the menu. Open 6 days a week, join us in the cafe or for takeaway. Harleston Village is the heart of a lowcountry historic district stretching down the west side of the peninsula. The neighborhood boasts some of Charleston's most distinguished landmarks like the College of Charleston, Harleston Green and the Wentworth Mansion. 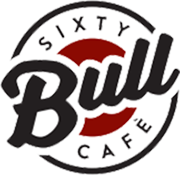 At 60 Bull Cafe, you'll hear the gait and jingle of a carriage tour as many streets, homes and trees look the way they did hundreds of years ago.